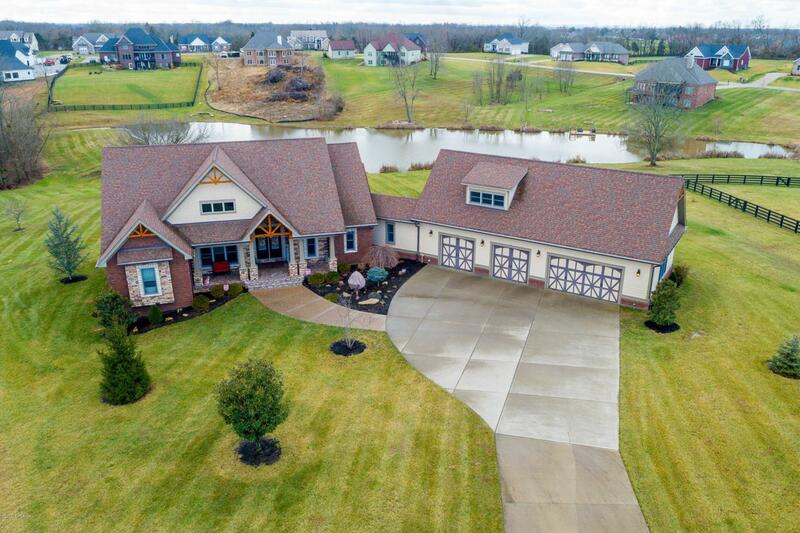 Ease of living, entertaining, and relaxation is a central theme at 130 Scarlet Ct. Fisherville, KY 40023. Beautiful - Craftsman Style Home on 3.2 beautiful acres. One of the largest lots in Fox Lair. Please review all pictures and the walk-through video. Meticulous exterior and interior touches went into this build. Exterior Amenities: Lot accesses stocked lake * Large fire pit area next to lake * Beautiful landscaping * Oversized driveway/walkway to stone front porch w/cathedral ceiling * Amish built front porch featuring hand selected Red Cedar beams * 4 Car Garage attached to the main home via a finished breezeway * 220 volt electric heater in garage * Unfinished Bonus Room above the 4 Car Garage * Exterior is dressed with brick, stoneand Hardie Board. Main Floor Amenities: HUGE foyer entrance * Vaulted/beamed Great Room w/a wall of windows looking over the large lot & lake * Great Room is open to the enormous Kitchen & Prep area & includes a breakfast bar, double oven w/convection, 5 burner cooktop, vegetable sink, granite counter-tops, abundant cabinetry, HUGE walk-in pantry * Stainless GE Profile appliances * Formal Dining Room w/cathedral ceiling covered in Pergo and two walls of windows that provide exceptional views * Sitting room off master bedroom (could be used as a bedroom and/or nursery) * Master Bedroom w/hip/vault/tray ceiling, 3 walk-in closets & built-in bookcases * Master Bathroom w/HUGE walk-in shower, relaxing soaking tub, double bowl vanities, private toilet room & grooming station * Executive Office w/coffered ceiling * Separate family office or E-room * Large laundry room w/plentiful cabinetry and sink * Half Bath. The entire main floor has custom ordered Siberian Birch Handscraped Solid Wood Floors with the exception of the master bath, laundry and breezeway which are tiled. Lower Level Amenities: Descend the open stairway w/hardwood treads to discover another home! Second Full Kitchen w/stainless appliances, abundant cabinetry, HUGE breakfast bar w/stone base * Dining Area * Wine Room w/custom stained glass insert * Billiard Area * Family Room w/custom built entertainment center * Two Very Large Bedrooms both w/HUGE walk-in closets * Full Bath * and get ready to fall in love all of you Crafters/DIYers - there is so much storage & working space on the unfinished side of the lower level you will run out of ideas to utilize all of it. The lower level is all tile with the exception of the two bedrooms which are carpeted. Extras: 3 access points on both the upper deck and lower level patio (both measure 12.3' x 44') * Built-in brick flower box on lower level patio * Hybrid Gas Water Heater * Gas hook-ups on upper deck and lower level patio * Water spigot on upper covered deck to make watering your plants very easy (plants love this deck) * Anderson 400 Series windows & doors. 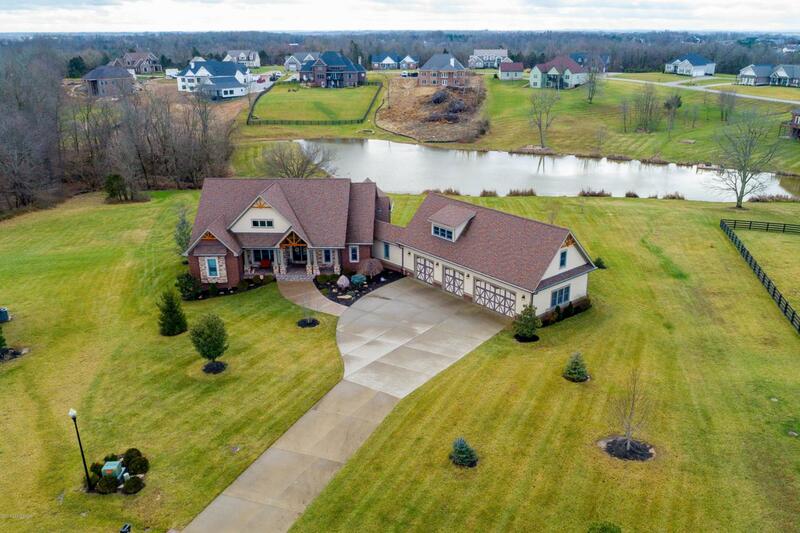 This home is very easy to entertain large gatherings, it is situated in a very peaceful setting and the neighbors...well you couldn't hand pick better neighbors. 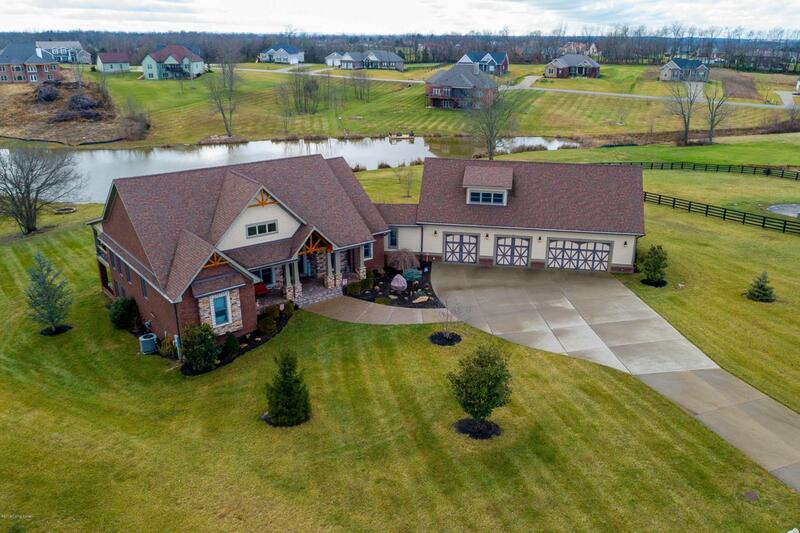 130 Scarlet Ct. Fisherville, KY 40023 was a dream home come true for the sellers and they wish they could pick this up and take with them when they retire. Easy/quick access to I-265, I-64 and everything city life has to offer.